I feel a renewed sense of excitement this time of year. It feels like, despite all of the challenges of recent years in so many ways, anything is possible in the future. I have been so fortunate to be involved in the studio glass movement for over three decades and I think that in many ways this glass phenomenon we call glass art is entering into a new stage of maturity and self-confidence. 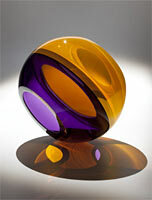 We are fortunate that nearly all of the seminal figures in contemporary glass are still actively creating new work. Glass artists such as Dale Chihuly, Dan Dailey, Marvin Lipofsky and Lino Tagliapietra are today producing some of their best work ever. At the same time, the second generation of glass blowers is now well established and we are also beginning to see a whole third wave of young artists who are bringing a fresh new vision to the glass world. 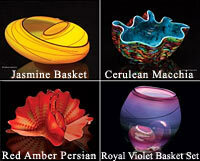 The year ahead and the years ahead look bright and promising for glass art! "I don’t know why I am, or the audience is, so fascinated but whatever it is, it isn’t of a grandiose nature. It’s much more subtle than that." Many of the artists on my website have recently given me new inventory to share with you. For all of these artists, I’d have to say that the work just gets better and better with time. I’ve selected a few pieces down the left side of this newsletter to whet your visual appetite and encourage you to click on any of these images to see more. Or visit the All Gallery Artists page to see what other artists are creating. The four smaller Studio Editions by Dale Chihuly for 2010 are still available and worth taking a final look at. As you can see, these are some of the most beautiful to date. I also have access to a limited number of Studio Editions from previous years. Please call or email me for pricing. I wish you all a new year full of peace, good health, joy and abundance!